Abstract: Osteogenesis imperfecta can be commonly mistaken for child abuse because of similar pattern of injuries. AA is a 3-week-old baby who presented to our emergency department with excessive crying. Skeletal survey revealed subacute spiral fracture of the right humerus, right posterior eighth and ninth ribs, acute fracture of the left femur, bowing of tibia and femur, and osteopenia. Subsequent geneticist examination and genetic testing noted blue sclera and heterozygosity for a variant of COL1A gene. Osteogenesis imperfecta (OI) can be commonly mistaken for child abuse because of similar pattern of injuries. Most cases are autosomal dominant mutations of type 1 collagen genes.1–4 It is important to acknowledge physical finding and order genetic testing early to prevent hardship to families and decrease medical expenditure. AA is a 3-week-old baby who presented to our emergency department (ED) with excessive crying. Parents noticed decreased movement of the left leg and right arm preceding the onset of AA’s sudden irritability. Parents denied recent fall, direct trauma, or shaking AA who lived with parents and two older siblings in a rented apartment in the city while visiting from Africa. There was no family history of easy bruising or fractures, domestic violence, drug/alcohol use, or involvement in social services. ED examination showed growth parameters at 10th percentile; AA was irritable and inconsolable with limited contralateral extremity movement; no bruising, pattern marks, or oral injuries were identified. Skeletal survey revealed subacute spiral fracture of the right humerus, right posterior eighth and ninth ribs, acute fracture of the left femur (Figure 1), bowing of tibia and femur, and osteopenia. Computed tomography scan was normal. MRI/MRA brain revealed left subacute subdural hemorrhage and right parieto-occipital calvarial flattening. Vital signs were normal, other screening laboratory tests were normal; eye examination was negative retinal hemorrhage. Department of Children and Family Services (DCFS) was notified for concern of nonaccidental trauma (NAT); siblings were taken into temporary DCFS custody. Subsequent geneticist examination and genetic testing noted blue sclera and heterozygosity for a variant of COL1A gene. Genes evaluated included BMP1, COL1A1, COL1A2, CRTAP, FKBP10, IFITM5, P3H(LEPRE1), PLOD2, PLS3, PP1B, SERPINF1, SERPINH1, SP7, TMEM38B, and WNT1 (Figure 2). Result was positive for COL1A coding DNA: C.371 G>T variant: pGly224Val (G224V) zygosity: heterozygous classification: pathogenic variant; no other reportable variants were detected by sequencing of the genes included on this panel. A written informed consent has been provided by the patient’s parents to have the case details and any accompanying images published for this study. Figure 1 Fractures at initial presentation. Abbreviations: R, right; L, left. Figure 2 Algorithm for evaluation of osteogenesis imperfecta. Abbreviations: OI, osteogenesis imperfecta; PE, physical examination. Figure 3 Services and consultation. Abbreviations: CT, computed tomography; PT, physical therapy. 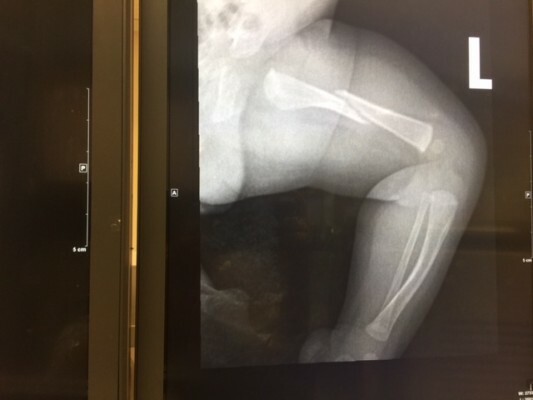 It is important in the initial investigative phases of unexplained fractures, families should be promptly provided social and psychological resources to help them cope with the unfortunate circumstances.8 The extent of such investigations when signs suggestive of confounding systemic diseases and consistent history should be balanced to ensure child safety as well as limit unnecessary expenditure. Tournis S, Dede AD. Osteogenesis imperfecta - A clinical update. Metabolism. 2018;80:27–37. Morello R. Osteogenesis imperfecta and therapeutics. Matrix Biol. In press 2018. Mitaka H. Osteogenesis imperfecta and blue sclera. QJM. 2018. Available from: https://academic.oup.com/qjmed/advance-article/doi/10.1093/qjmed/hcy060/4942476. Accessed August 27, 2018. 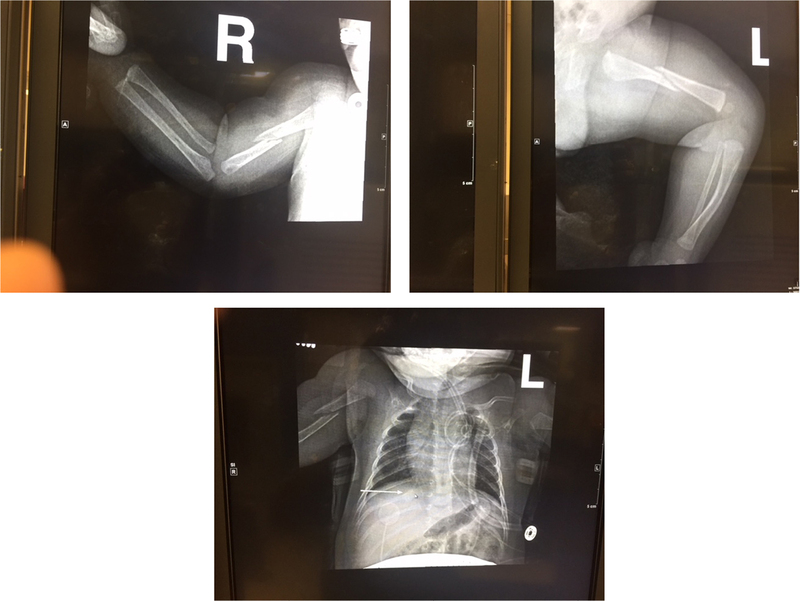 Harrington J, Sochett E, Howard A. Update on the evaluation and treatment of osteogenesis imperfecta. Pediatr Clin North Am. 2014;61(6):1243–1257. Zarate YA, Clingenpeel R, Sellars EA, et al. 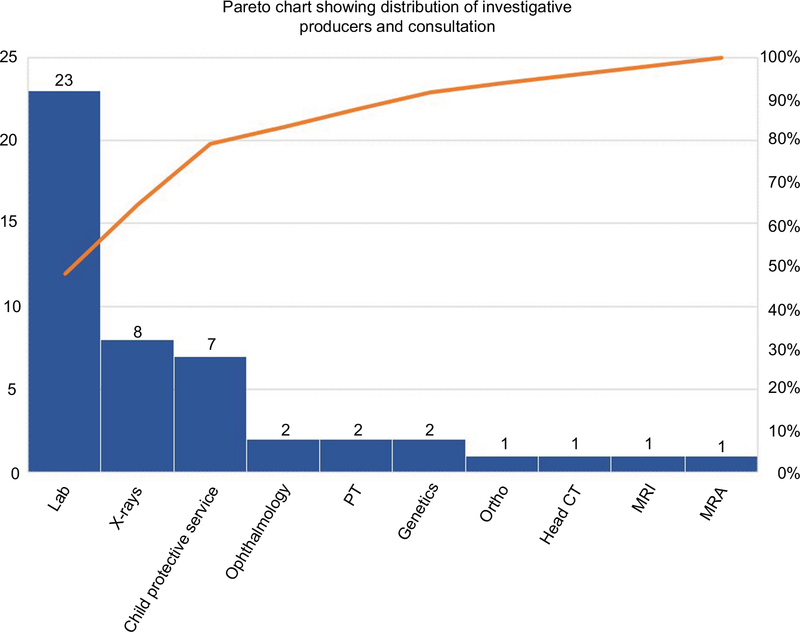 COL1A1 and COL1A2 sequencing results in cohort of patients undergoing evaluation for potential child abuse. Am J Med Genet A. 2016;170(7):1858–1862. Caparros-Martin JA, Aglan MS, Temtamy S, et al. Molecular spectrum and differential diagnosis in patients referred with sporadic or autosomal recessive osteogenesis imperfecta. Mol Genet Genomic Med. 2017;5(1):28–39. Bureau of Labor Statistics. Measuring Price Change in the CPI: Medical Care; 2018. Available from: https://www.bls.gov/cpi/factsheets/medical-care.htm. Accessed May 10, 2018. Pereira EM. Clinical perspectives on osteogenesis imperfecta versus non-accidental injury. Am J Med Genet C Semin Med Genet. 2015;169(4):302–306.